Week 1, Day 3 – Who Is Man? And God said, Let Us [Father, Son, and Holy Spirit] make mankind in Our image, after Our likeness, and let them have complete authority over…. all of the earth….So God created man in His own image, in the image and likeness of God He created him; male and female He created them. There are differences of meaning/interpretation to the word “Image & likeness”, which includes theories such as Image/likeness as rational and moral beings, image as in community and dominion, etc. From yesterday’s devotional, we saw that God is a family cos of who He is and from eternity past He’s been sharing/expressing the nature of Himself (Love) with Himself. So what’s if the image and likeness is actually the nature of His being. So when God said Le’s make man in our Image; what’s He’s saying is let make man like us with our nature (i.e. the nature of Love). And when God had formed the body of Adam He breath His nature into Him. Then Adam became like God, without him even realizing it. When this happened the whole of creation including the angelic beings watched in wonder and awe, some probably in shocked at what God had done. For the first time in all of creation God had put His nature into another being outside of Himself. Why? I am sure some wondered? All of God’s creation has His life thus the name living things, but only Man has God’s nature within them. 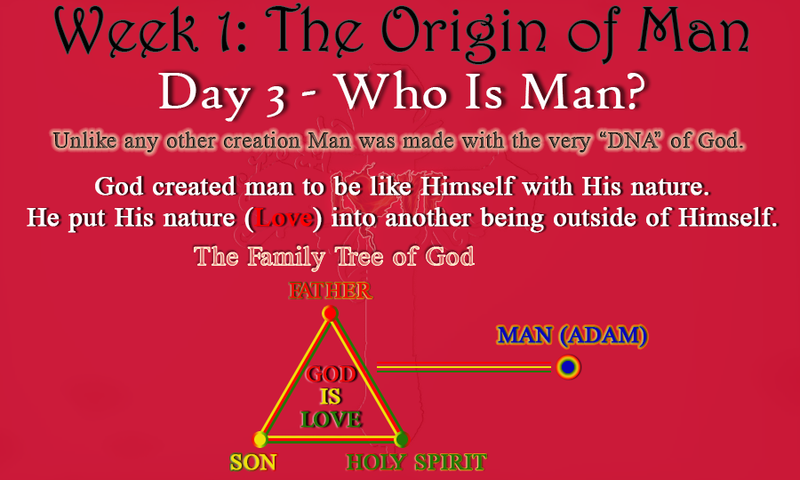 Man (Adam) was made by Love (God) and through Love (God). We’ll look into this more when we talk about the master plan of God, next week. But for now, let’s just say he felt that way because of the God nature within Him. The core nature of love requires an object other than itself to love. 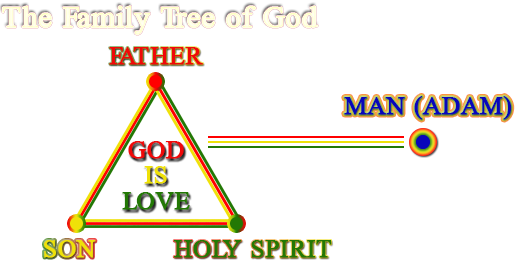 Just like God, the nature of His being is to Love and for that He is a family (Three beings). Adam sure got all the love he needed from God, but the very essence of Love is to GIVE. Receiving love is the reward of giving love. So love is true to its nature when it gives not when it receives. Adam in a sense had all these love within Him, but no one to express it to. Sure he had God and he did love God back but unfortunately for him God was not like Him (in glory and stature). Even though Adam was unaware that he had a similar nature like God, He’s still locked in a physical matter called the body/flesh while God is of far superior form. So though he truly did express love to God, relationally he was far too below God and for that he felt alone (no one like him). God knew this from the start, It was Him who said it’s not good for Adam to be alone (Gen 2:18). Everything was a learning experience for Adam and I can imagine God wanting to teach Adam something about his frame. So He brought all the animals for Adam to name them. Adam started giving names to the animals and then it clicked “wait a minute every creature comes in two (male and female); Even God Himself. How come I’m the only one like me?” Can I also have another (female) version of me, he probably wondered? Again I’m imagining God going to Adam, “good, you’re getting it. You already have it; It’s within you.” Remember God made Adam perfect and complete man. Therefore, Adam had within himself both the female and male attribute of a man. But unlike God he cannot be two people within himself. So God took from him the female man and brought her to Him. Finally someone to whom He could relationally express his love towards. Someone like him; he’s no longer alone. You were made with the very DNA of God for that reason His love for you is as strong as death and jealously unyielding as the grave. His love burns like a blazing fire, like a mighty flame for you. He’ll go through hell and back to have you for himself (which He literally did). Thank you father, for making me be like you. I have your nature; the nature of love within me. Lord help me to see the depth of this Love you have for me, that I may love you and others with the very love you’ve given me. Enlarge my being, that I may grasp the magnitude of your love for me. In Jesus name. Amen.